io9 is proud to present fiction from Lightspeed Magazine. Once a month, we'll be featuring a story from LIGHTSPEED's current issue. This month's selection is "A Tank Only Fears Four Things" by Seth Dickinson. You can read the story below, or you can listen to the podcast version. Enjoy! Image © 2014 Elizabeth Leggett. Please visit Lightspeed Magazine (www.lightspeedmagazine.com) to read more great science fiction and fantasy. This story first appeared in the May 2014 issue, which also features original science fiction by Sandra McDonald ("Selfie"), along with SF reprints by Nisi Shawl ("Deep End") and Sean Williams ("Zero Temptation"). Plus, we have original fantasy by Matthew Hughes ("The Ba of Phalloon," a Kaslo Chronicles tale) and Fred Van Lente ("Willful Weapon"), and fantasy reprints by Rachel Pollack ("Burning Beard") and Rajan Khanna ("Second Hand," from the new book, DEAD MAN'S HAND: AN ANTHOLOGY OF THE WEIRD WEST). All that, and of course we also have our usual assortment of author and artist spotlights, along with a pair of feature interviews. For our ebook readers, we also have the novella reprint "Shiva in Shadow" by Nancy Kress and novel excerpts from DEFENDERS by Will McIntosh and THE SILK MAP by Chris Willrich. You can wait for the rest of this month's contents to be serialized online, or you can buy the whole issue right now in convenient ebook format for just $3.99. It's another great issue, so be sure to check it out. 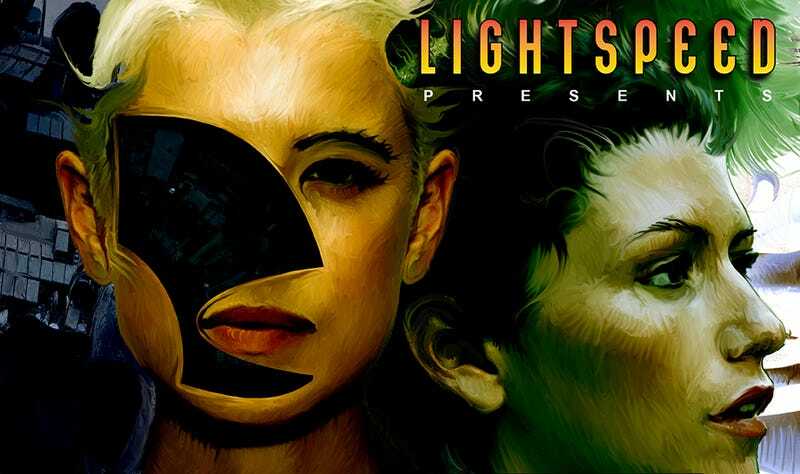 And while you're at it, tell a friend about Lightspeed!